After the joyful experience of reading stacks of OzYA fiction as one of the judges for the Readings Young Adult Book Prize, I went on an international YA reading binge. Here are five of my favourite YA novels of recent times. I adored this smart, romantic and thoroughly entertaining debut novel. Dimple and Rishi are both headed for Insomnia Con – an intense web development competition held at San Francisco State University – but for completely different reasons. Trailblazing Dimple sees the Con as the first step in her glittering tech career and a way to catch the eye of her hero, tech mogul, Jenny Lindt. Rishi simply wants to meet Dimple, the girl both sets of parents have pegged as wife material. Naturally the course of love runs disastrously. The Insomnia Con competition is fierce, and the initial exchanges between Dimple and Rishi even fiercer (drinks are thrown). The story unfolds at breakneck speed in short alternating chapters, and I found myself extremely invested in Dimple and Rishi winning the competition, and in both of them realising that, deep down, their values were not that different. Menon explores class, culture, gender and identity with subtlety and levity in this entertaining narrative. The intense Con setting puts a bunch of ambitious young people from extremely diverse backgrounds together, without the usual adult control or influence, so sparks do fly. Dimple refuses to toe the line on expectations of her as a young woman, and as a young Indian-American woman, but this stance doesn’t go without comment or consequences. I love it when romantic books don’t neglect friendships, and liked that the new connections that Dimple and Rishi make are as important as whether or not the couple end up together. The Smell of Other People’s Houses won the American Library Association’s William C. Morris Debut YA Award this year, and I’m so glad that win spurred me to pick it up. I have never read a YA novel quite like this one before. Four Alaskan teenagers – Ruth, Dora, Alice and Hank – tell their first-person stories in an interwoven narrative that spans four seasons in 1970, only a year after Alaska gained statehood. Each young person has their own struggle: Ruth falls pregnant, Inupiat Dora tries to stay clear of family violence, Alice can’t find a way to reconcile her passion for dancing with her affection for the family fishing business, and Hank and his brother flee their new stepfather. Bonnie-Sue Hitchcock worked in radio for many years, including a stint where she presented real-life stories as the host and producer of Independent Native News, a daily newscast focusing on Alaskan Natives, American Indians, and Canada’s First Nations. I suspect her work background has influenced her writing, which focusses on unique, clear and authentic young voices. The teens in this book are funny, fallible, vulnerable and strong, and their struggles are presented with compassion and realism. Poverty, family breakdown and inequity are described from the inside, and the characters make and find family and hope wherever they can. The language is poetic and literary – without pretension and never at the expense of diminishing the youthful voices. The Alaskan towns, rivers, seas, forests and landscape are drawn with loving, visceral detail. I learned so much about Alaskan culture and politics from reading this, and I particularly appreciated the cultural information garnered from Inupiat Dora and her Athabascan foster sister, Dumpling. 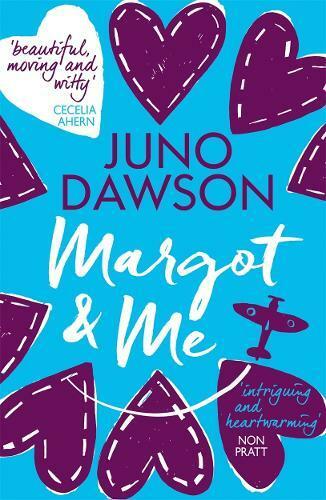 It’s almost impossible for me to go past a YA set in WWII, so I was immediately intrigued by the premise of Margot and Me which connects with that period of history via a secret diary. It’s 1998 and Fliss has had a hard couple of years, helping support her single mum through cancer treatment. When her mum’s health improves, it’s hard to decide why her mum would move them from familiar London to the Welsh countryside to live with Fliss’s grandmother Margot. Fliss has never gotten along with Margot, a stern career woman who surprised everyone with her decision to run a small Welsh farm, and their first few days at the farm confirm this in spades. Margot is hostile enough that I forgave Fliss’s questionable (and slightly vengeful) decision to help herself to, and read, her grandmother’s old wartime diary when she stumbles upon it in the attic. It’s at this point that the narrative divides into two equally absorbing and well-developed parts: Fliss’s current challenges, and Margot’s wartime record. Margot’s experiences cover the joys of first love and first betrayals, racism and hypocrisy in 1940s Britain, and the exigencies and terror of the war. Meanwhile, Fliss – flawed, feisty and worried about her mum – tries her best to understand the social nuances of a small rural school, fend of the resident mean girl, weather Margot’s gruff ways and form a new friendship squad. Fliss thinks the diary will contain material with which to needle Margot, but instead she finds herself relating to and liking the younger version of her grandmother. And when she eventually does uncover several huge family secrets, Fliss finds her desire to use them against anyone has faded. This is a wonderful family drama, full of tension, laughter, love and reconciliation. Though be warned, it’s also incredibly sad due to more than a few surprises along the way. Get ready to cry. As an avowed child of the nineties – the fashion and pop culture references were an added bonus for me! Reading Under a Painted Sky last year was enough to turn me into a read-anything-Stacey-Lee-writes type of fan, so I waited avidly for the paperback version of Outrun the Moon (hardbacks make my arms tired). This is a vivid and detailed telling of the cataclysmic earthquake that hit San Francisco in 1906, decimating the city and resulting in fatal fires in Chinatown. Mercy Wong is 15, has ‘bossy cheeks’, and is obsessed with a business book by Victorian-era mogul, Mrs Lowry. She’s ambitious, smart, more than a little in love with her childhood friend Tom, and under no illusions about the limitations placed upon her as a Chinese-American girl. Fortunately Mercy has a take-no-prisoners attitude to life and develops a daring and astute plan to ensure she attends the prestigious (for well-bred white girls only) boarding school, St Clare’s School for Girls. St Clare’s does not go smoothly for Mercy – inbuilt prejudice is hard to overcome, and boarding school proves to be a social nightmare – but really, her troubles are only beginning as the city is about to be literally ripped apart at the seams. Outrun the Moon is such a wonderful slice of historical life. I really felt as though I had time-travelled and experienced Chinese-American life of the early twentieth century, and broader American society as well. Lee is skilled at weaving cultural, historical and political issues around a character-driven narrative, and I love how she makes her feminist heroines work within the constraints of the time. Mercy’s ambition, resilience and compassion come to the fore in the aftermath of the city-wide disaster, and the friendships among a disparate group of girls is believable, heartwarming, and despite the serious subject matter, funny. Much has been written about this outstanding debut novel and my colleagues have already rightfully declared it one of the best YA books of 2017. 16-year-old Starr lives in two worlds: her familiar home life in Garden Heights where her father owns a convenience store, and her school life at the privileged and predominantly white Williamson High. Starr manages to juggle her two lives and two versions of herself (with some effort), but this switching back and forth becomes untenable when she is the sole witness to a fatal police shooting. Starr has been schooled by her parents from a young age on what to do when approached by police – keep your hands visible and don’t make any sudden moves – but these lessons mean nothing when she and her childhood friend Khalil are pulled over by the police and an officer inexplicably shoots and kills the unarmed Khalil. A lot of the publicity around The Hate U Give has described it as a Black Lives Matter novel. While it undoubtedly does expose the fears, lies, bias and prejudice around racialised violence in America, this story is also a delicate, compassionate and thoughtful exploration of a young woman under extreme pressure. Thomas crafts Starr’s bewilderment and grief perfectly. Then she piles on the pressures that the teen faces as the only witness to a crime, as well as someone who knows the real Khalil – not the thug inaccurately portrayed in the media. Personal needs clash with community needs as Starr struggles with the decision to testify before a grand jury, and whether she wants to enter the world of activism. Woven around this central issue are some of the more vexing aspects of Starr’s life – having a white boyfriend her father would definitely not approve of, subtle acts of racism from supposed friends, the challenges and poverty of her local community, and a close friend dealing with a violent family life. If you love authentic teenage first-person voices, social commentary, big emotions, political activism and wry humour, you really should read The Hate U Give.